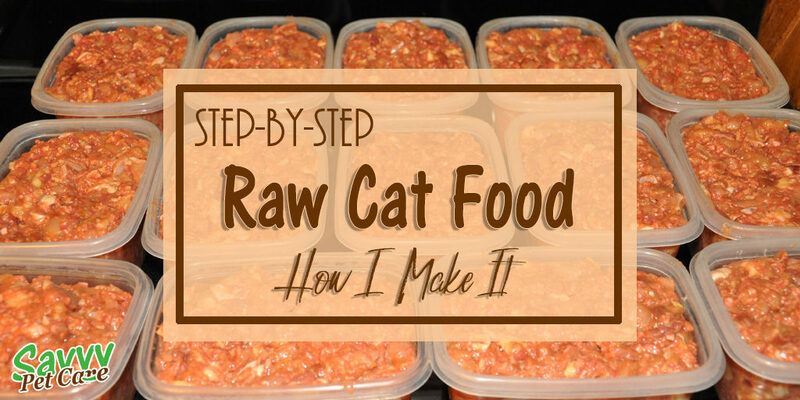 It’s time for me to make raw cat food, which I do about every two weeks, so I thought I’d show you how I do it. My original reason for trying raw food was my adopted foster cat, Christy Paws, who had recurring bouts of severe diarrhea. I had her tested for parasites and she had low levels of giardia and coccidia as well as tritrichromonas, an often overlooked parasite in cats. I treated the giardia and coccidia with the normally accepted drugs and, after much research and consultation with my veterinarian, we decided to treat the tritrichromonas with tinidazole. After the weeks of required treatment, the condition improved but came back again after a short time. So I had to ask myself, was it really the parasites causing the diarrhea or was the improvement just a part of the cycle of her chronic condition? More research led me to think it might be inflammatory bowel syndrome or, hopefully, just a dietary sensitivity. Christy didn’t seem “sick” and didn’t lose weight so when I found the wonderful website, CatInfo.org by Lisa A. Pierson, DVM, I decided to try feeding her raw cat food. 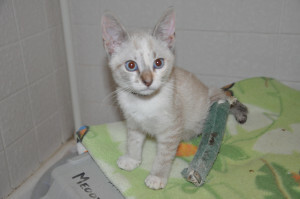 I was a relatively new foster when Christy Paws came to me in September of 2009 recuperating from a broken leg and a partially amputated tail. This diet is different from the Paleo Diet in that it does not add any fiber (fruits or vegetables). That’s fine for dogs who have evolved into omnivores, but cats are still strict carnivores and are not equipped to efficiently digest fiber. 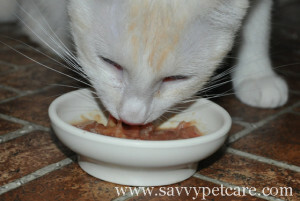 This diet also contains the calcium that is essential for your cat’s health. Christy was having an episode when I started feeding her raw food and within two or three days, the diarrhea was gone and she hasn’t had it since — that was two years ago! Actually, I can’t say that. On a few occasions, I have run out of raw food and resorted to canned for a meal or two. By the next day, I was regretting it. 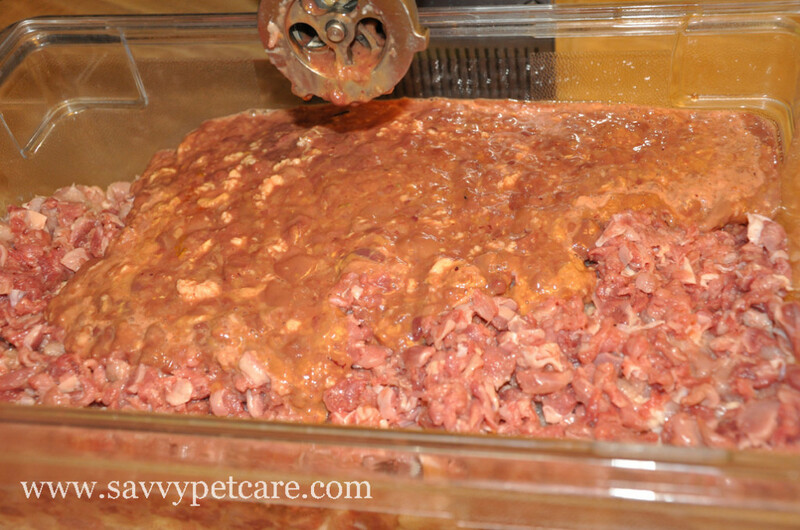 The first thing you need to do if you are making a commitment to making raw cat food on a regular basis is to purchase a food grinder. You need a unit with a strong motor and, preferably, metal inner parts. 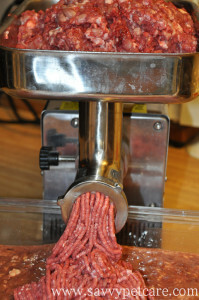 I purchased an LEM #5 1/4 HP Stainless Steel Big Bite Heavy Duty Electric Meat Grinder online at MeatProcessingPoducts.com for about $250. There are less expensive models that will do the job but I knew I would be making a LOT of food and wanted a grinder that would last — and this unit cuts through the bones like butter. If you don’t want to invest in a grinder to grind bones and all, you can still make raw food. You can grind just the meat in a food processor, or even hand chop it, and add bone meal to the recipe. The next thing you need to do is order your supplements. As healthy as raw food is for your cat, they are not eating the whole animal and we can rarely find the organ meats they would eat in the wild which contain some essential elements. You will need fish oil capsules (a source of essential fatty acids), vitamin E, vitamin B-complex, and taurine (found in the heart and essential for cats). I order what supplements I don’t get at Costco from iHerb.com. Use the code NOJ441 and you’ll receive up to $10 off your first order and MeoowzResQ will receive a donation. 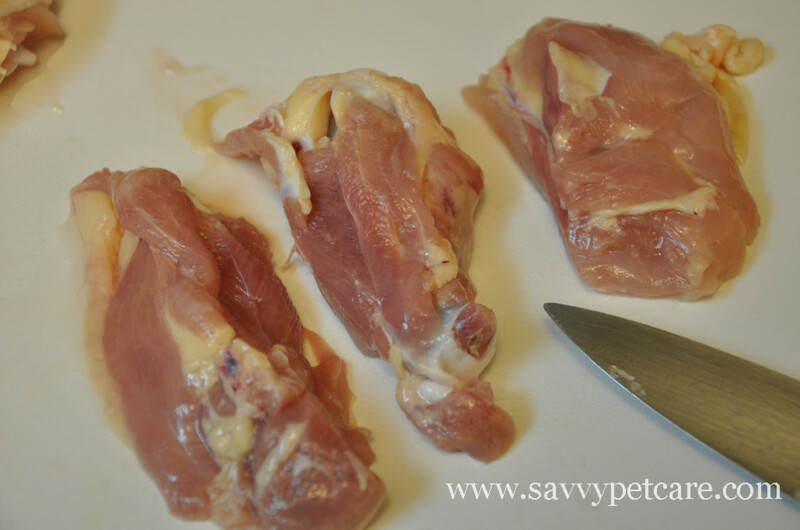 2.25 lbs of whole carcass ground rabbit + 0.75 lbs of boneless chicken or turkey meat/skin/fat. 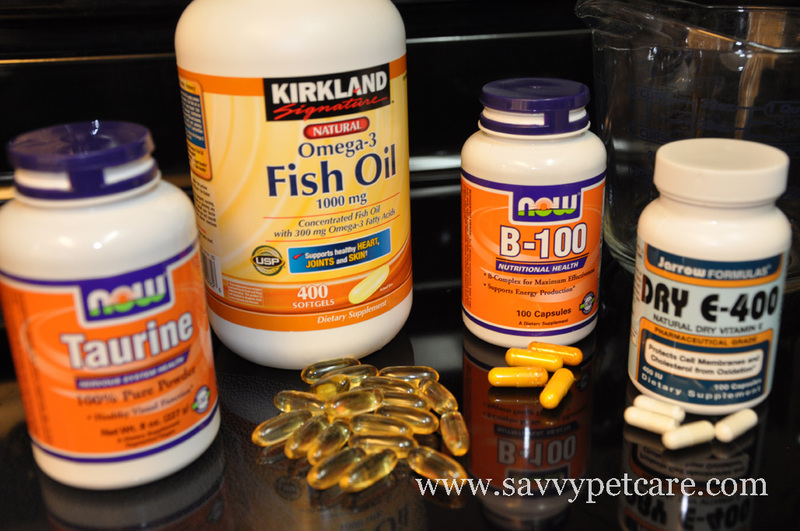 2000 – 5000 mg fish oil (a good source of essential fatty acids) Do NOT use cod liver oil! 3/4 tsp Morton Lite salt with iodine when using chicken but not when using rabbit (contains potassium and sodium – make sure that it contains iodine.) 1/2 tsp if you use regular salt. Liver – If using ground rabbit (which includes liver), do not add additional liver. If using chicken legs, thighs or a whole chicken carcass minus the organs, add 4 ounces of chicken livers per 3 lb of meat/bones/skin. 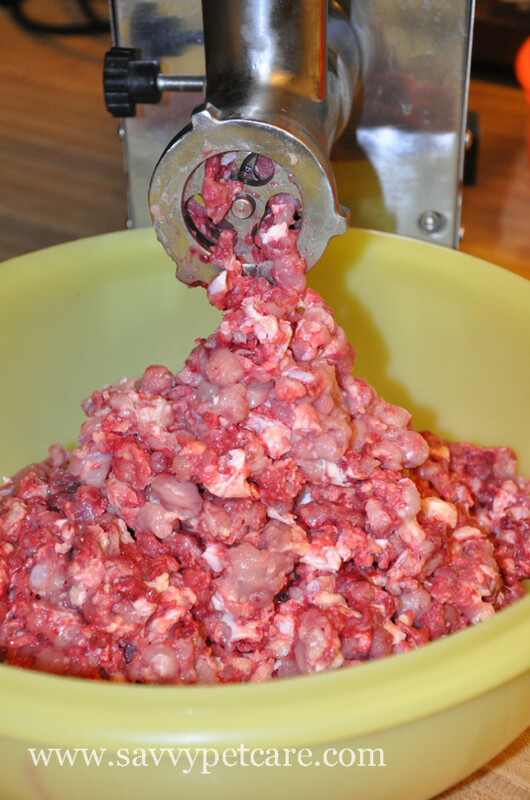 It is tedious to get all the meat off the bones, so I add three pounds of gizzards, rather than removing some of the bones, to dilute the calcium (bone) to phosphorous (meat) ratio. Please see the CatInfo.org website for an explanation of this element of the diet. When I first started making raw food, I bought whole chickens and cut them up. I quickly found this to be too time consuming and started buying just the thighs. The thighs are actually better as they have a higher fat content. I buy the large packages at Costco for $1.19/lb and make about 20-25 pounds of food at a time. The average cat eats 4-6 ounces per day so this amount would feed one cat for about two months — and it only takes about an hour and half to make including clean up. Of course, that wasn’t always the case. It has taken a while to get a routine down, but now it goes pretty smoothly. I put about two cups of hot water in a measuring cup and add all the supplements (8 times the amount in the recipe as this is 25 lbs of meat) to give everything time to dissolve while I am preparing the meat. I remove about half of the skin from the thighs. I found my cats were putting on too much weight when I left all the skin on. Then I just make one cut down each side of the bone to remove most of the meat. 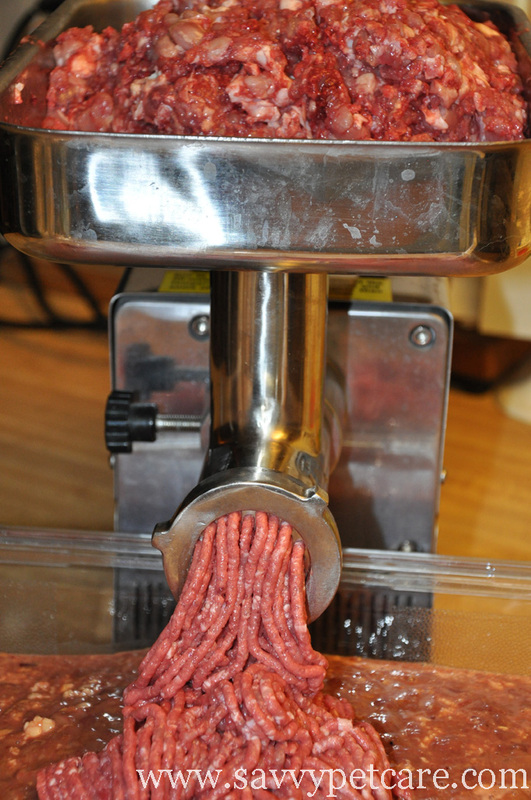 I grind the meat, liver and gizzards through the large grinder plate and set it aside. Cats like chewing on these larger pieces and they may give them some dental benefit. I grind the bones for the first grind through the large plate also. Then I replace the large grinder plate with the small one and grind the bones a second time. This comes out looking like hamburger. The bones are very finely ground and their are no sharp pieces, so don’t worry about your cat choking on bones. 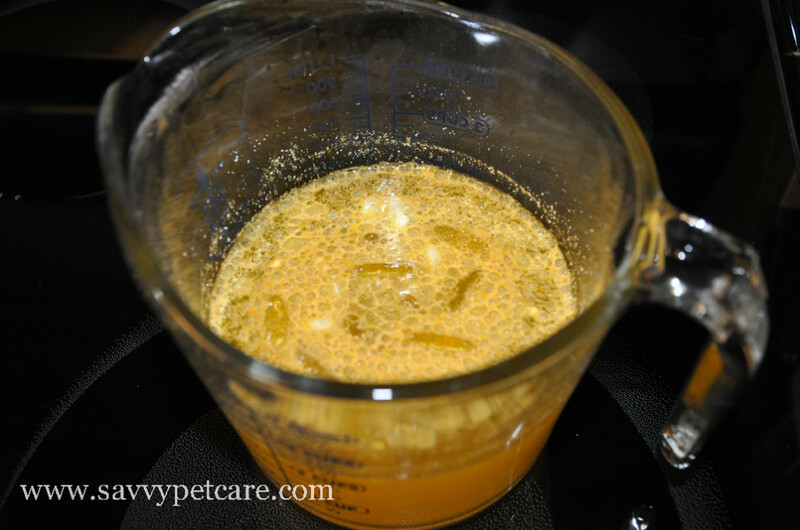 I pour my dissolved supplements in and stir until everything is thoroughly mixed. I do not add the optional eggs and I do not put the full amount of water in at this stage. I add the rest of the water when I actually feed so I am not freezing all that extra water and taking up precious space in my freezer. Once everything is thoroughly mixed, I divide it into 24-oz plastic containers. Some people use baggies, and I tried them for a while, but I find the rigid container easier to fill and store. Don’t overfill your containers. They will expand when they freeze. 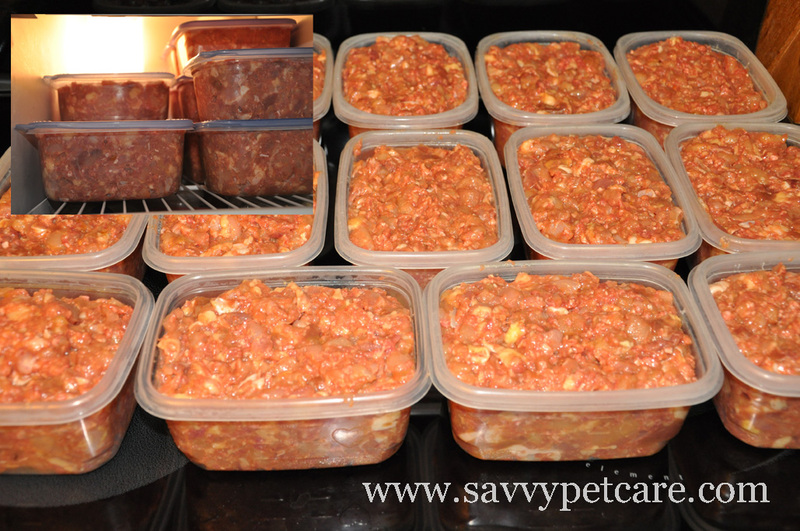 And, voila, less than two hours later I have 25 pounds of fresh, raw food that my cats love. When I’m ready to feed it, I take about two ounces per cat and add enough water to make it the consistency of a thick chili. I warm it in the microwave on VERY low power to about body temperature. Be careful not to cook it. The supplements are just a guestimate and probably quite a bit higher than the actual amount. 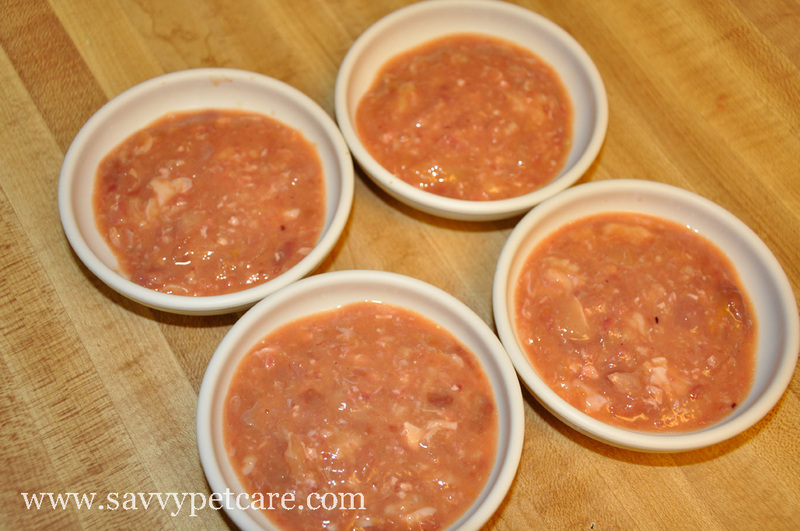 So for less than $35, I have 25 pounds of high-quality, raw cat food with chicken as the main ingredient. You can do the math. That’s just $1.40 per pound. Let’s compare that to, say Friskies which, by the way, is a very decent canned cat food. 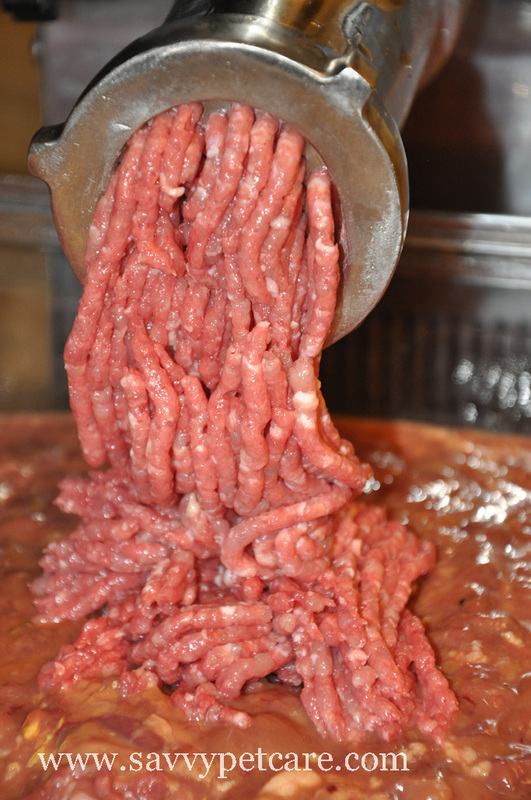 Check your labels and make sure real meat is the first ingredient, not a grain or grain by-product. So a case of 48 cans of Friskies weighs 16.5 pounds and costs $20.50 at Costco. That is $1.24 per pound. How do you think a gourmet, grain-free canned food would stack up? If you feed raw food or decide to give it a try, leave us a comment and let us know how it works for you. I hve a adult cat 13 yrs old and now looking for real food for her to put more waight on and look better. I’ve been making raw with that recipe for a while but I’ve started adding the iodine Dr. Lisa recommends as well. I don’t dissolve the supplements, I throw them in the grinder and they get mixed in along with the livers. Hi Connie! I’ll look into the iodine supplement. The iodine in my current recipe comes from the iodized salt. I’ve tried just throwing the supplements in the grinder but it didn’t work well for me. Maybe I’ll try again because it definitely is easier. I’m about to start feeding my cats raw food. But I have trouble finding the meat and liver, heart… all at once. So is it possible to use frozen parts and grind them together with the fresh meat ? I’ve reading in several post that pet’s owner order their meat frozen from different sources, so does it mean they thaw it, mix it and freeze it again ? How can I do to do the right thing ? Wonderful that you have made the commitment to start feeding raw. Yes, you can freeze, thaw and refreeze it. I often do that. I was wondering, how much of the food that you give per cat per day? I am very interested in this. I have five kitties.. my posse! Five girls, and would like to find something healthier. Hi Terri! 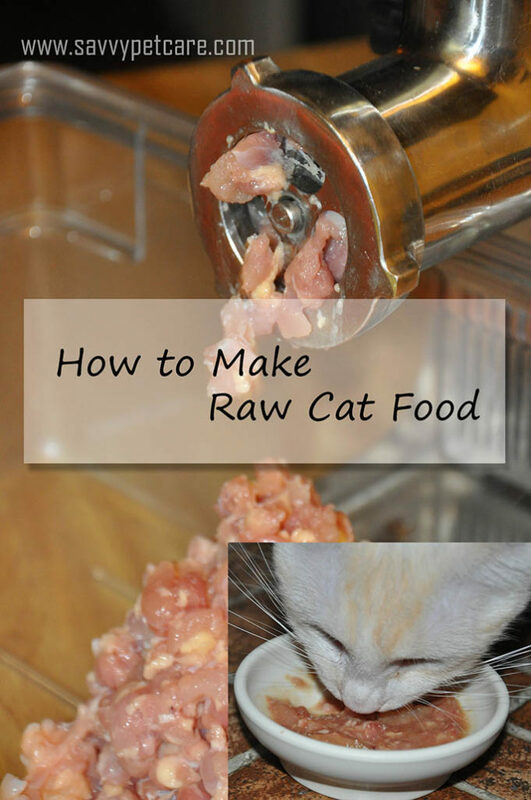 Each kitty needs about 2-3 ounces of the raw food twice a day. wow, I didn’t really understand what a raw diet was…. thanks for sharing! thank you for visiting us today – and we are totally bookmarkign this! 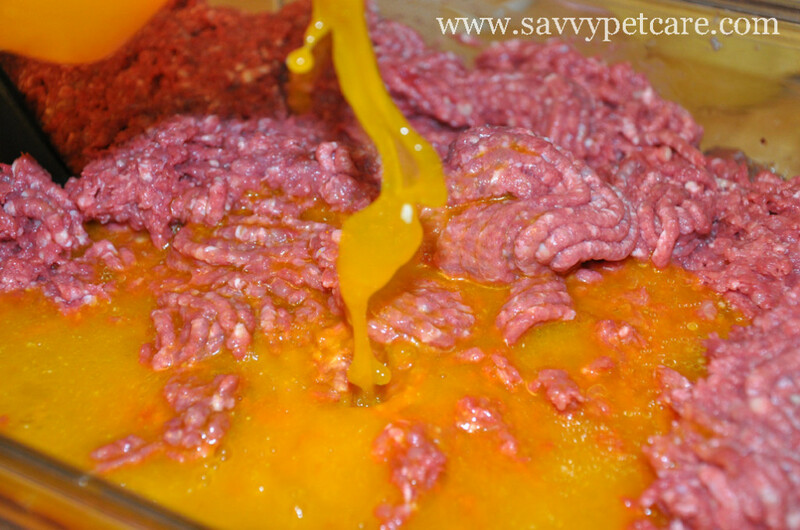 We’ve wanted to make our own raw (yes, we feed raw too) and haven’t had the time to look up a good recipe. Thanks! Great! It’s been a learning experience but totally worth it. Thanks for visiting!